Here in Nashville, we got to see the total eclipse today. It did get dark and the crickets started chirping! The 'blue' picture is at 'totality' (nothing showed up with the filter at that point). Taken with my PHD (push here dummy) Olympus 780 Stylus. Quite a sight isn't it Phil?! .. and an experience that's difficult to put into words. 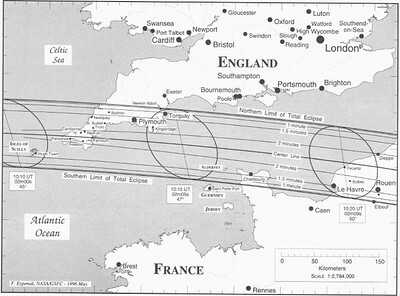 We had a total solar eclipse here in Cornwall at 11:11am on August-11, 1999. A once-in-a-lifetime (if you're lucky) event that you will never forget. Nice UP. I was in Cornwall in - but it was cloudy. Gareth R wrote: Nice UP. I was in Cornwall in - but it was cloudy. Gareth, yep, the eclipse was clouded-out for most of Cornwall. As I re-call, Aug-11 1999 was the only cloudy day in a week of blazing sunshine. Maximum eclipse duration was 2m 23s along a corridor in the western end of the county. For this reason, the majority of visitors - including TV astronomer Patrick Moore - were watching in places like St Ives and Falmouth, but were mostly shrouded under a thick blanket of cloud cover. But some of us got very lucky. Ellen & I were on Towan Headland, Newquay, that mid morning - where the full eclipse lasted for around 1m 30s - when a large gap in the clouds passed directly under the sun just in time (about 10 minutes beforehand) to reveal a clear view of the eclipse through this passing window. Fellow watchers along the coastline from Perranporth up to Padstow got the same lucky break. As the full sunlight returned following totality, a great cheer rose up from all the crowds who had gathered for miles along the north Cornwall cliff tops. Quite amazing! 15 minutes after the event .. the sky was 100% cloud covered again. I have to say that the clouds' parting was as magical as the eclipse itself!! Magic space pixies do it:-). Indeed it is special even tho we fully understand what's happening.